Orange markers popping up around Greendale have some worried people they’ll lead to 5G technology. 5G wireless home internet is making its debut in cities around the country, but has not been installed anywhere in Wisconsin yet. 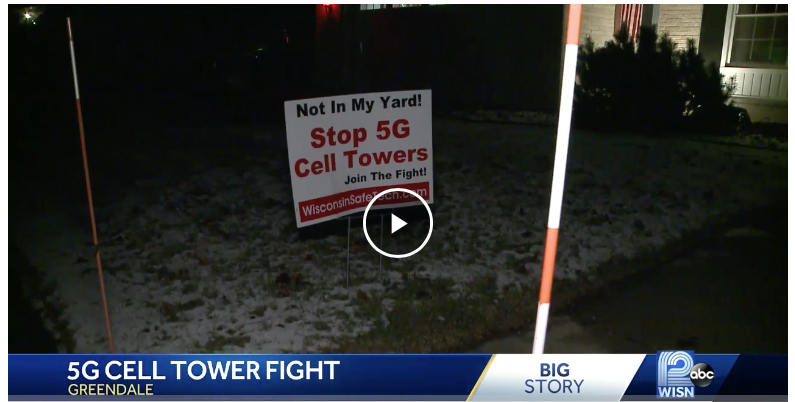 One Greendale-based organization wants people to know how dangerous wireless devices might be, especially with the close-range cell towers associated with 5G technology. Unger has joined hundreds of doctors, scientists and organizations around the world pushing for a moratorium on 5G. A spokesman for Verizon Wireless said the orange markers in Grendale are for fiber-optic cables to go underground and extend their current 4G LTE coverage. He also said the technology Verizon uses is constantly reviewed by health and safety organizations around the world, and is in accordance with FCC guidelines. Unger said those guidelines are out of date and need to be changed. She wants safer technology for homes and warns users to hardwire their devices and stay away from wireless technology as much as possible. Thank you to KS for sharing this story with us @ Z5G!